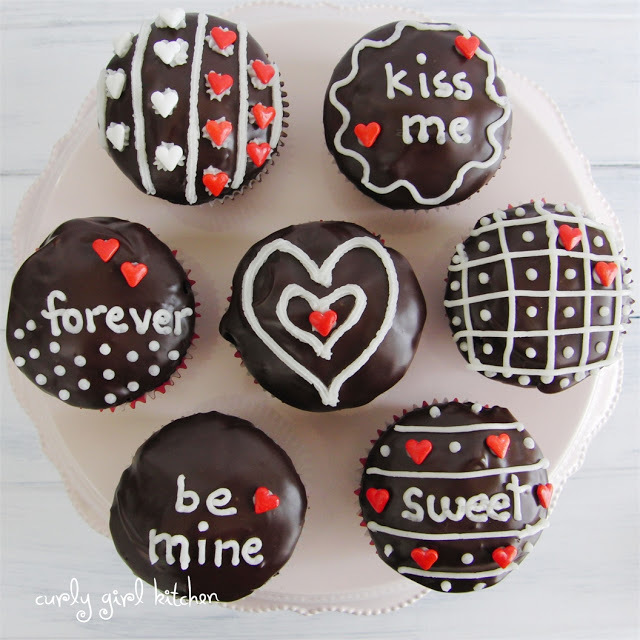 Not only does Heather from Curly Gurl Kitchen provide an absolutely delicious recipe for chocolate cupcakes, but she also shows off her fabulous cupcake decorating creativity for Valentine’s Day. 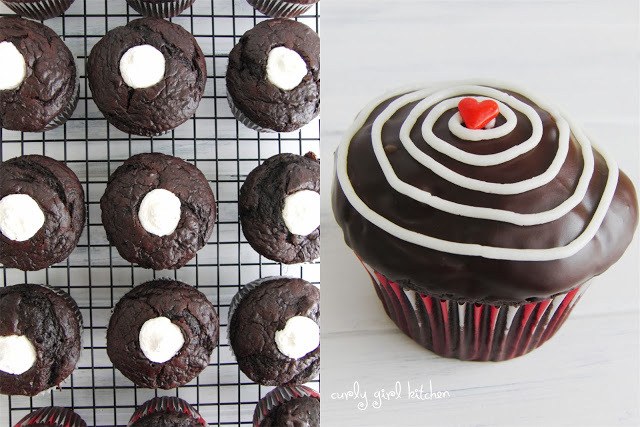 These are mouth-watering dark chocolate cupcakes, moist and rich with sour cream, tart cherry juice, and expresso powder. A simple whipped cream filling and topped with bittersweet ganache to send you into heaven. In the bowl of your stand mixer fitted with the paddle attachment, combine all of the cake ingredients on low speed, then beat for 3 minutes on medium speed. Spoon the batter into the paper liners. Bake on the middle rack, rotating the pans once, for 14-18 minutes, until a toothpick comes out with moist crumbs (don’t overbake). With an electric mixer, combine the butter, shortening, powdered sugar, meringue powder, clear vanilla andpiping gel in a bowl until combined. Add milk or water, just a few drops at a time, and mix until the icing becomes the right consistency for piping. If it’s too dry, it won’t flow smoothly out of a small round tip, so if you’re not sure, test a little first and then add more liquid as needed.